This Video on YouTube introduces the ATLAS 9000 Corneal Topography System. Click here for the video. The Atlas Corneal Topographer is a device that shines a placido disk on the eye. The Placido disk is an illuminated series of concentric rings. 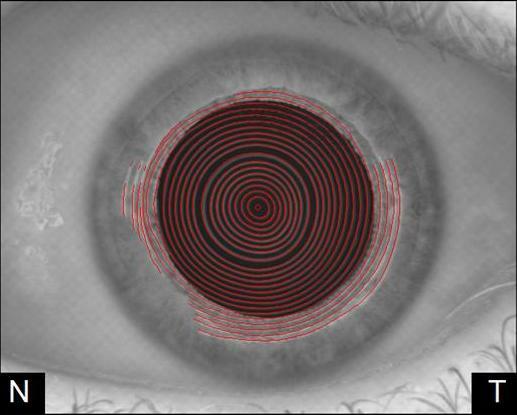 These rings are reflected back from the cornea and are captured by a camera. These rings are then analyzed by a computer program to create a topographic map. The topographic map then provides a tremendous amount of information about the shape of the cornea. Regularity of the front surface of the cornea is determined from this corneal topography. When combined with a corneal thickness map (pachymetry) from the Visante Anterior Segment OCT, the Visante omni, is capable of providing information about the back surface of the cornea and therefore the entire cornea. The ATLAS Corneal Topographer has undergone gradual improvement over the past several years. The 993 model had a pink light projector. So when an image was being acquired the ring series in the head would glow pink. The problem with this model is noted when attempting to take a topographic image of a dilated eye. The brightness of the pink light is very uncomfortable to most patients and usually satisfactory image is less likely. The 995 model improved with a dark blue/purple light. This change in the color has made it much more comfortable for dilated patients. The software for the 993 and 995 models are identical. The 9000 Model has significant improvement in the hardware and the software. The projector rings are now in the invisible infrared light range, which is imperceptible to patient, therefore comfortable and does not affect the pupil size. 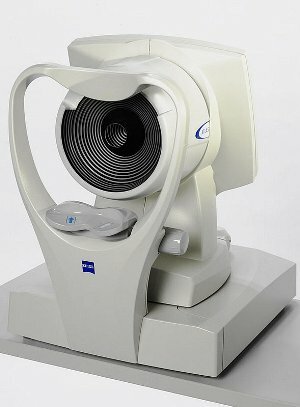 The ATLAS Corneal Topographer is based on a placido disk technology. The Image of the discs can be seen on the right. Theses rings are standardized in perfect round rings and the reflection is then analyzed. In the case of this placido image one can see that the ovalized images is irregular (upside down egg shape). Once the image is acquired the image is recognized by the computer system and the rings is analyzed by measuring the distance between the ring and the regularity of the shape. The Placido disk topography has been the standard of corneal surface evaluation for past several decades. Its importance has been far more emphasized in the LASIK era. There are many fine subtleties that must be appreciate to prevent poor outcomes. The ATLAS Corneal Topographer 9000 is armed with a PathFinder II software. The PathFinder II is a excellent aid in pointing out mathematically concerning criteria. This obviously is a great starting point, but the results are not absolute and must still be interpreted and weighed by the experience of the interpreting doctor. The computer generated interpretation of this ring follow a fairly complex series of calculations. The Axial Curvature Map, Tangential Curvature Map, Refractive Power Map, Mean Curvature Map, Elevation Map and Irregularity Maps are some of the interpretation. These will explained in some detail in the following pages. Perhaps some of the greatest advance and understanding that has come to our attention in the LASIK era has been the understanding of the importance of the posterior corneal surface. As I had mentioned earlier, the ATLAS Corneal Topographer is only capable of providing the interpretation of the anterior (front side) corneal surface only. Visante omni 3.0 link to ATLAS corneal topographer now provides a comprehensive evaluation of the Anterior (ATLAS) corneal surface, corneal thickness map (Pachymetry, Visante), and now the posterior (the inside or backside) corneal surface (The Visante omni). This has been a true revolution in our understanding of the cornea and is helpful in identifying patient's candidacy for LASIK or other corneal treatments. Stay tuned!! !